Heat the oil in a large pan, add the onion and celery and fry over a gentle heat for 5 minutes, until softened but not coloured. Add the chicken and fry until golden. Pour in the stock and milk and add the potatoes. Cook for about 40 minutes, until the potatoes are soft and the chicken is tender. Remove the chicken from the liquid and shred using forks. Remove two big ladlefuls of soup (including quite a generous amount of the potatoes) and liquidise until smooth. Return the mixture to the pan and stir well. Add the shredded chicken. 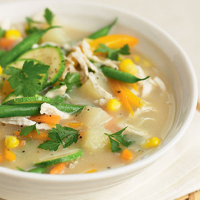 Stir in the remaining vegetables, bring back to the boil and cook for a further 4–5 minutes, until the vegetables are soft but retain a little bite. Stir in the chopped parsley, season and serve at once. A light red with plenty of balancing acidity makes a refreshing contrast to the vegetable subtleties here.